We are having so much fun with the new smoker. To be honest, I kind of poo pooed it at first. Although we have a small one it is still quite a big space hog in our garage. Plus it is time consuming to use. When we are going to use it we have to plan out the afternoon or even day to make sure we are around to monitor the smoker. It was just another thing to think about and deal with...I am trying really hard to minimize what I deal with these days. Well we made these chicken legs and I went to heave. They were so good. The flavor of the smoking process made these chicken leg irresistible. Never, ever will I criticize the smoker. We seasoned the chicken with a wet slurry inside the chicken skin and then added additional seasoning on the outside of each leg before smoking. The wet slurry really infused the flavor into the chicken and kept the meat moist. We like a bit of spicy heat in our food and these chicken legs at a bite with the addition of paprika and True Made Foods Veracha sauce. The Veracha sauce as you probably guess is a variation of Sirracha sauce only so much better. True Made Foods makes their sauces using real vegetables, real food. Since having Miss O we have become even more adamant about eating healthy, particularly limiting the amount of processed foods. True Made Foods fits the bill with using real food, no additional sugar. Plus it is made in the US by Veterans. How's that for a 4th of July recipe. Being just 3 of us this recipe made a ton. However a couple of days after cooking these chicken legs I found myself eating the last leg, much to Mr. J's dismay. I cannot wait for another lazy weekend to smoke so more of these chicken legs. In a small bowl mix together 1/2 each of salt, pepper, garlic powder, onion powder, paprika, and True Made Foods Veracha sauce to create a slurry mixture. In another small bowl mix together the remaining 1/2 of salt, pepper, garlic powder, onion powder, and paprika. Spread spice slurry beneath the skin of the drumsticks. Season outside of drumsticks with the other bowl of remaining dry ingredients. Transfer chicken to preheated grill and cook at 400 degrees for 15 minutes. Brush on True Made Food Veracha sauce in the last five minutes of grilling. This is the third recipe for #CookoutWeek 2016. Be sure to check out the giveaway for some cool, summer cookout supplies. Wednesday! Hump day! This week needs to fly by. The last two days have dragged on a bit. It must be because I am looking forward to the long holiday weekend. I needed to make a quick trip to Florida this week. Boy is Florida hot. I don't even think it was so hot for them but I couldn't take it. As soon as I went outside I wanted to run back into the A/C. All this hot weather made me crave any and everything that would help me cool off. I got a popsicle mold this year and have been hankering for the chance to whip up my first batch of popsicles. Well after sweltering in Florida for a few days I knew the time had come. Being my first attempt I went with a pretty easy recipe. We had fresh strawberries and I wanted something creamy. Thus these strawberry cheesecake popsicles fit the bill. There are no crazy ingredients. Everything is thrown into the blender and then whipped up together. So easy! To make it more cheesecake like, I added some graham cracker crumbs to the top (bottom?) of the popsicles after the mixture is poured into the molds. I think that is my favorite part. I had such a good time making these popsicles. I have about a million more recipes ready to go on a Pinterest board. I cannot wait to try them. In a small bowl, combine graham cracker crumbs and melted butter until a crumbly, moist mixture forms; set aside. In a blender or the bowl of a food processor, combine cream cheese, strawberries, confectioners’ sugar, milk and Greek yogurt. Scoop the mixture evenly into popsicle molds, leaving 1-inch for the crust. Press graham cracker crumb mixture over the top of each mold, using your fingertips to gently press the crumbs into the batter. Add popsicle sticks to the center of each cup. Place into freezer until fully frozen, at least 4 hours. We made the ultimate pulled pork sandwiches this weekend. They were good for so many reasons. First the recipe for the pulled pork is for a crock pot. You basically do two steps and you get a pot full of pulled pork. 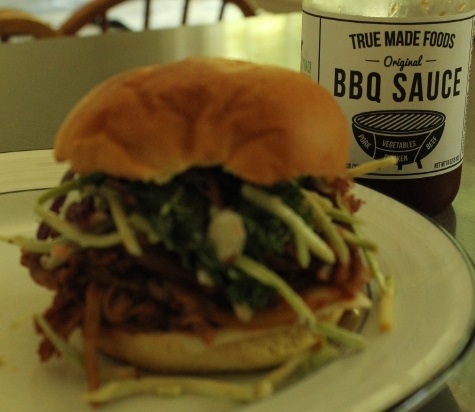 When making the pulled pork we used a new BBQ sauce from True Made Foods. I think it might be a new favorite. True Made Foods uses vegetables to make their products taste better and to sweeten them naturally, cutting added sugar in half. Have you ever look seen how much sugar is in BBQ sauce? Even thought there is half the added sugar of leading brands, the BBQ taste is amazing. Second, the bun is brioche. Love brioche. Finally the sandwich is layered with cheese and broccoli coleslaw. This adds some crunch with the pulled pork. *True Made Foods provided me with a sample pack of three sauces, including this BBQ. All opinions are my own. Put in the roast and cover with water. Cover and cook on LOW for about 10 hours overnight. Remove the meat and discard all liquid. With two forks, shred the meat, discarding any remaining fat, bones or skin. Most of the fat will have melted away. Put sliced onion into the clean slow cooker bowl. Return the shredded meat to the bowl and stir in the barbecue sauce. Continue to cook for another 3 to 4 hours on LOW. Place a slice of cheddar cheese on the bottom of the bun. Top with a large pile of the BBQ pulled pork. Add broccoli slaw and cover with top of bun. Serve immediately. Welcome to day one of #CookoutWeek! If you haven't seen the giveaway going on, check it out here. There are all sorts of cool BBQ prizes to win. Before smoking we covered all of the ribs with Swine Dining's Wimpy BBQ rub. This rub was perfect for us since we were going to share with Miss O. Although most of the time she likes hot and spicy food, you never know with a toddler. With this sweet rub we didn't have to worry about her closing her mouth and shaking her head "no" at dinner time. You can make your own rub but when you are trying to prep for dinner it is easiest to go with a pre-made mixture. Swine Dining makes every batch by hand to ensure quality and freshness. You only need to open the container and smell to know this is true. We have a smaller electrical smoker. It doesn't get hot enough to cook the ribs thoroughly enough to eat right from the smoker so we grilled ours to finish them off. Of course, I think grilling also adds another flavor dimension to the ribs so we probably would have done so anyway. After about 5-7 minutes on each side we added BBQ sauce and the meal was done. Rub liberally with Swine Dining's Wimpy's BBQ rub seasoning. Smoke with hickory chips for 2 hours at 160 degrees. Grill at 400 for 5-7 minutes per side. Finish with your favorite BBQ sauce and serve immediately. * I recieved a sample pack of Swine Dinig's rubs and seasonings for this post. All opinions are my own. Hello Friday! I am so glad it is almost the weekend. This week was super busy at work. Mr. J was gone. I don't know how single parents do it. Between work and managing Miss O on my own the week went by fast but the days were super long. I am exhausted. To make it manageable with all of the moving parts I tried to simplify and plan ahead as much as possible. This little gem of a dinner was super easy to throw together and was fairly quick with cooking time. Miss O knows that once we are in the kitchen food is coming. Her waiting time is about 5 minutes. Thus any meal that takes longer than 15 minutes to cook is pretty much a no go unless we can do it on the sly. We have been doing a lot of grilling and it was nice to have something baked for a change. The chicken tenders are dredged in flour, egg bath and then a mixture of flour, breadcrumbs and cornmeal, and then baked on a cookie sheet. The potatoes and green beans were cooked together on a separate cookie sheet. Two cookie sheets and a complete dinner. This wasn't too fancy but a great meal, comforting meal. Preheat oven to 375F. Spray a baking sheet with oil. Season the chicken tenders with salt and black pepper. In a shallow dish, season 1/2 cup of flour with salt and black pepper. In another shallow dish beat the eggs. In a third shallow dish, place the other 1/2 cup of flour, breadcrumbs and cornmeal. Dredge the chicken tenders in the flour to coat, shaking off any excess flour. Dip the floured chicken tenders into the egg and finally, coat the chicken tenders with the breadcrumbs. Place the breaded chicken tenders onto a baking sheet and bake in the oven for 12-15 minutes, until golden brown. My mind is a bit blown away that it is almost the fourth of July. I really think each month disappears before my eyes. I am happy for the fourth because we are going on vacation with family. My brother and his family will be in the States and all of the kids will be able to play. I cannot wait. Last time the two babies were really just babies. Now they are full blown toddlers and I hope they love and play together. This past week also turned hot. It has been gorgeous weather so far, sunny days but cool breeze and I haven't thought twice about dinner plans or turning on the oven. However, temperatures soared earlier this week and I tried to think of easy meals with limited oven use. I made this broccoli coleslaw as a side to a grilled BBQ chicken dish and it totally hit the spot. Coleslaw is typically off limits for this gal as it is full of the dreaded mayo. I won't go near it. This recipe however uses apple cider vinegar to soften the veggies and is sweetened with crushed pineapple and dried cranberries. Sound delicious? Well, no worries because it is! I am still too worried to give Miss O raw veggies like this but she enjoyed partaking on a few stray cranberries. I thought this would be more of a "me" dish but even Mr. J dug right in and had a huge serving. This is perfect for a make ahead dish or a picnic side. I know this will be a repeat over and over again this summer. In a large bowl mix together all of the ingredients. Toss thoroughly to incorporate liquids completely with the broccoli coleslaw mix. Add salt and pepper to taste if desired. Chill for at least 4 hours before serving. I have chocolate for you all today. Not just chocolate but little sandwiches made of chocolate and peanut butter and graham crackers. It truly is heaven in your mouth. This beauties came about for the June posting of #‎thebookclubcookbookCC and honoring the book Chocolat. I was a fan of the book and the movie before June. It was fun to reread the book. Being a fan of chocolate and France, well it was a good time. Not familiar with the #thebookclubcookbookCC? Well it's a group of 11 bloggers where each month we pick a book, to read or not is up to you, and then make a recipe either from The Book Club Cookbook, Revised Edition: Recipes and Food for Thought from Your Book Club’s Favorite Books and Authors by Judy Gelman and Vicki Levy Krupp or something inspired by the book. If you are interested in joining see this post from Camilla, our leader or Sarah's invitation for June. There is a giveaway at the bottom of this post for two copies of The Book Club Cook Book so keep reading. The recipes for this month were hot chocolate and chocolate fondue. Both super tempting. Hot chocolate or chocolat chaude is a prominent feature in the book but given it is June and the temps are creeping up I didn't think it would timely to post a hot chocolate recipe. There are many themes to Chocolat intertwined between the characters of a small French town: good vs. evil, love and dogma. For me their there was a sense of doing good for one's soul, a necessity to such. And like the novel I am a big fan of indulgence through food, mainly chocolate. These little sandwiches were pure indulgence. Chocolate, graham crackers, peanut butter and more chocolate. One little one was enough to transport me to a feeling of calmness after a long hectic day. The ability to stop and forget everything else for just one moment to enjoy this chocolate treat. 1. Draw inspiration from the chosen recipe. 2. Blog about it! It doesn't have to be a lengthy post. Just share your dish. 3. Include a linkback to the hosting blog somewhere in your post. 4. Your post must be current to June. Of course,we don't mind if your post is linked to other events. The more, the merrier! *watch for the roundup to be posted shortly after this deadline! Be sure to check out the other bloggers participating as well! Line a cookie sheet with wax paper or parchment paper. Melt 1½ cups of the chocolate chips and 1 Tbsp of butter in a microwave safe bowl or big glass measuring cup. Stirring at every 20 second intervals until fully melted and smooth. Dip each graham cracker half into the chocolate, tapping or gently scraping off the excess chocolate. The graham cracker should be totally covered. Set each chocolate covered graham cracker on the cookie sheet and place in the freezer to set up quickly. While the chocolate covered graham crackers are setting up, make the peanut butter filling by mixing the peanut butter and powdered sugar. Mix until smooth and creamy. Roll into 12 equal dough balls and chill in the freezer for about 15 minutes. Pull out the chilled chocolate covered graham crackers and peanut butter balls. Gently flatten the peanut butter balls to the size of the graham cracker and place it on the chocolate graham. Gently spread it to the edges so it's evenly distributed. Be careful not to break the graham cracker pieces. Melt the other 1½ cups of chocolate chips with 1 Tbsp of butter. Stirring until smooth. Gently spoon chocolate over the peanut butter layer and spread around with a spoon covering the top and sides. Put back in the freezer to set up (about 15 - 20 minutes). If you want to be fancy, pull out and drizzle left over chocolate over the top of each graham cracker. Store in the fridge in an airtight container for up to a week. This month Sarah at Thing I Make (for Dinner), this month's host, is giving away two copies of the book. * Enter to win a copy of the cookbook so you can join us in future months, if you wish! TWO of our lucky readers - US and Canada only! - can enter to win a copy of The Book Club Cookbook, Revised Edition: Recipes and Food for Thought from Your Book Club's Favorite Books and Authors by Judy Gelman and Vicki Levy Krupp, courtesy of Tarcher-Penguin. Giveaway runs from June 1st till June 30th at 6 o'clock PM, Pacific time. Please see terms and conditions in the rafflecopter widget below. Many thanks to Tarcher Books. You may find Tarcher: on the web, on Facebook, on Twitter, and on Pinterest. *Disclosure: Sarah received a complimentary copy of The Book Club Cookbook, Revised Edition: Recipes and Food for Thought from Your Book Club's Favorite Books and Authors by Judy Gelman and Vicki Levy Krupp as an opportunity to give a copy away. Opinions are our own. We received no further compensation for our posts. A self-proclaimed foodie writing about everyday food occurences.